EMA(50) and EMA(100) both applied to the candle close. This is what determines the "trend". If EMA(50) is above EMA(100) we will only be looking for a Buy trigger. If EMA(50) is below EMA(100) we will be looking for a Sell trigger. 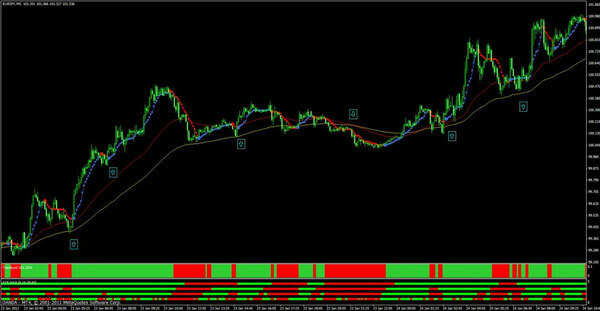 BBands Stop (8,2,0.2,1,1,1000, true) applied on the chart with blue and red colours. IfBBStop is blue it means long if BBStop is red it means shortl. However, what we will take as a Sell trigger is that BBStop has turned red, and is BELOW both the EMA(50) and EMA(100). ALSO the price has crossed below the candle where theBBStop "large red dot" appears. 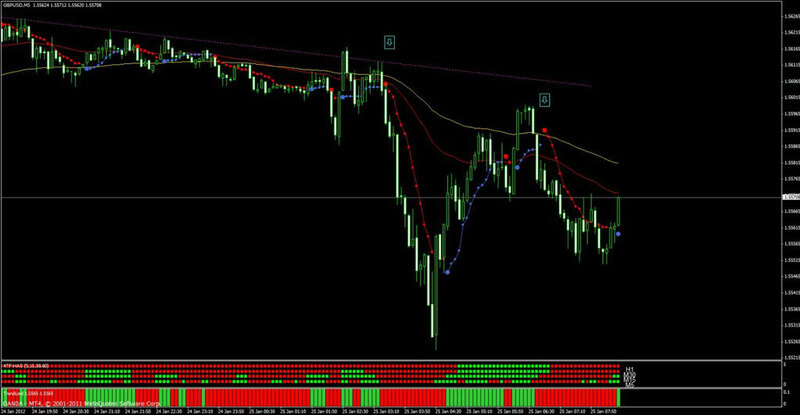 This large red dot is the start of the down trend according to BBStop. This large BBStop dot will produce an alert on your platform so it is a nice way to let you know we might be getting a trend setup soon. Reverse the above for a Buy. These are TrendLord and 4TF-HAS are used to confirm your trade. 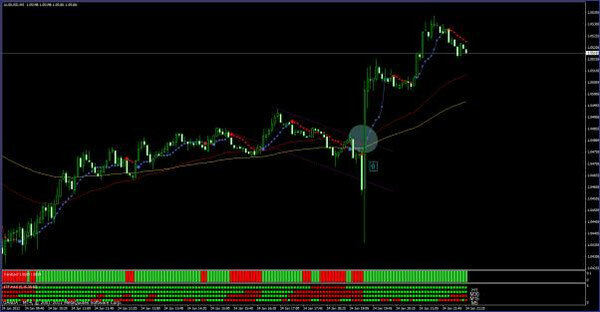 Once the setup and trigger indicators are all lined up for you to take trade, take a final look at the confirmation indicators to make sure they agree with your decision. The 4TF-HAS and Trendlord have to be red for a sell, and green for a buy. A word of caution about these indicators when your charts get stale (not updated in a while your screen saver kicks in or whatever), you may need to refresh your charts by switching to a diffrent time frame and back to the desired time frame on the chart to refresh the indicator. That is the basic system in a nutshell. There will be many details to iron out I am sure such as TP target, SL placement, re-entering a trade, etc. I generally like to use the last swing high/low (or the big dot) as my SL, and then set my TP target as 1:1 on 1/2 my position and 1:2 on second 1/2 of my position and using a jumping stop on this second 1/2 position. I am sure there are many ways to manage a trade and this can be discussed in the thread among followers as each trader's comfort and risk level is different than others. I will be giving general guidelines, but then again nothing is etched in stone here. AFST Exact entries is a pivot point calculator that places the daily pivot points on your chart. If you would like to use those as possible turning points or TP/SL targets, you can use this indicator (with default settings) at your discretion. In the pictures Bollinger Bands Stop trading system in action.